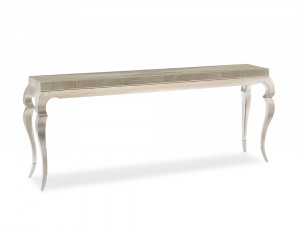 Designed with exquisite style, this stunning Console Table offers a modern aesthetic, that yields the beauty of natural elements. Crafted with Birch, Pine and Black Curly Maple. Two drawers with fronts and end panels adorn with Silver Capiz Shell. Drawers with soft-close under-mount drawer guides. 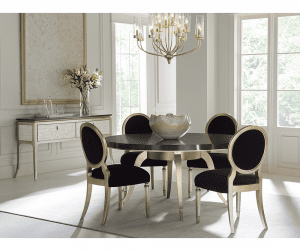 Delight in this visually enticing, contemporary table collection. Geometrically angled edges for a more airy, three-dimensional look. 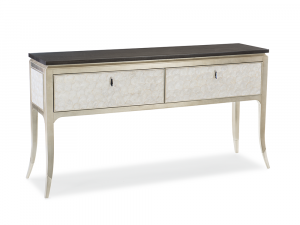 Every piece features royal gold metal frame with ingot-shaped wooden top in luscious matte chocolate wood finish. Complete occasional collection available to order in-store. 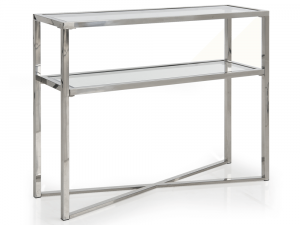 Cocktail and end tables available in square or rectangular shapes, with rectangular console table to match. 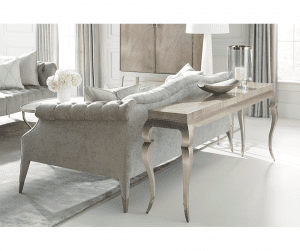 Constructed with oak veneers in matte chocolate finish. 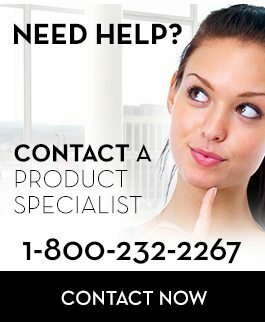 Top and base available only as shown. 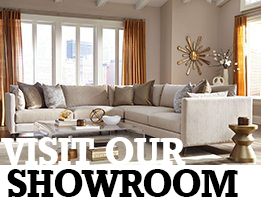 Bring focus to your living room. 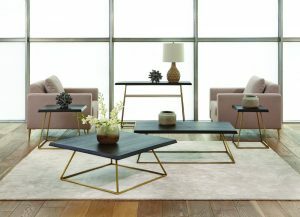 Simple yet eye-catching table collection with stunning natural travertine table tops, supported by textured bronze metal frames. 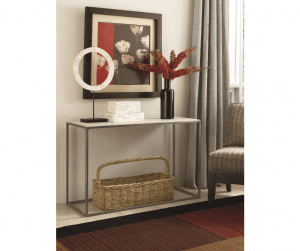 Sofa table as shown. 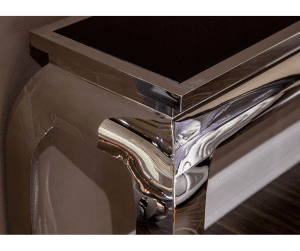 Wide array of matching nesting tables, cocktail, end and sofa tables available to order in-store. 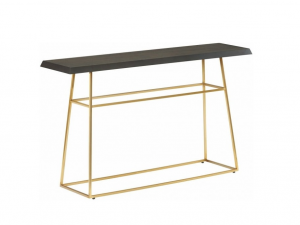 Whether placed in a hall, dining room, or front entrance, striking elegance is easily attainable with the addition of this sensational console table. 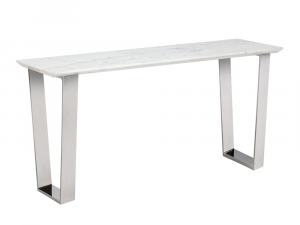 Available to custom order with your choice of brushed gold or stainless steel finishes and white marble or black marble top. 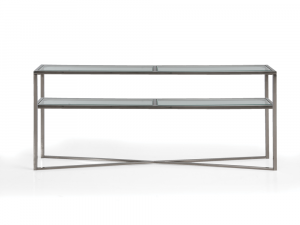 This sleek style Console Table lends modern day design with minimalist functionality. 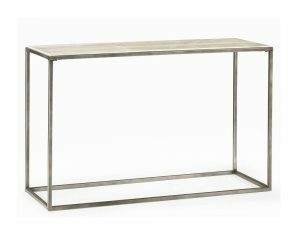 Supporting a flush 10mm glass top, the small Console Table features a slim stainless steel frame with polished finish, offering contemporary beauty to any living space. 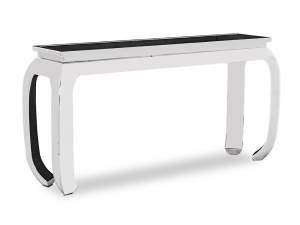 Supporting a flush 10mm glass top, the large Console Table features a slim stainless steel frame with polished finish, offering contemporary beauty to any living space. 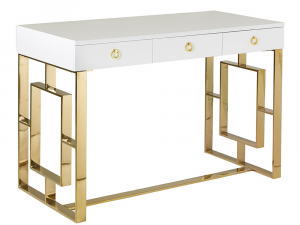 Flaunting an opulent combination of gracious curves with clean cut edges, this contagiously alluring, and visually radiant, Console Table captures the attention, and earns the respect, of all who gaze upon it. 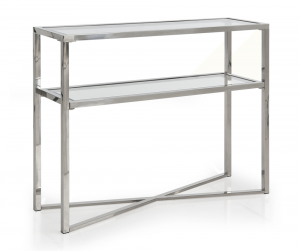 Metal frame with a flush glass top.